The Honda CR-V has been the best-selling SUV in America for a while now, and for good reason. No other vehicle on the market balances utility, affordability, performance, and style the way this one does. The 2014 Honda CR-V is no different than the 2013 Honda CR-V, primarily because last year’s model proved to be such a hit with critics and Mechanicstown drivers alike. Why mess with something everyone loves? You can see it now at Middletown Honda, but in the meantime, these are the features you can find in a CR-V from either model year. 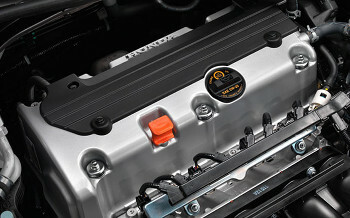 The CR-V comes with 2.4L four-cylinder engine that puts out 185 hp and 163 lb-ft of torque. Unlike some of the massive SUVs you have seen on the road, the CR-V focuses on providing drivers with functional — rather than excessive — amounts of power. It is thanks to that approach that the 2014 Honda CR-V gets an EPA estimated 23 mpg in the city and 31 mpg on the highway when equipped with front-wheel drive. * The 2013 model achieves similarly impressive efficiency. The engine comes paired with a five-speed automatic transmission, all-wheel drive is an option. The 2013 CR-V and the 2014 CR-V are available in three distinct trim levels: LX, EX and EX-L. Each offers something unique, and Mechanicstown drivers can choose the features and options that are most important to them to get a CR-V that is tailored to their exact needs. LX trims come standard with 16-inch steel wheels, automatic headlights, keyless entry, full power accessories, air conditioning, cruise control, a tilt-and-telescoping steering wheel, 60/40-split folding rear seats, a rearview camera, a six-inch infotainment display, steering wheel-mounted audio controls, Bluetooth connectivity, and a four-speaker sound system with a CD player, Pandora compatibility, an auxiliary audio jack, and a USB/iPod interface. The EX trim adds 17-inch alloy wheels, fog lights, a sunroof, rear privacy glass, a retractable cargo cover, and a six-speaker to the sound system. The premium EX-L trim comes with everything mentioned earlier, along with roof rails, heated side mirrors, dual-zone automatic climate control, an eight-way power driver’s seat with power lumbar support, leather upholstery, heated front seats, and an upgraded sound system with seven speakers and satellite radio. 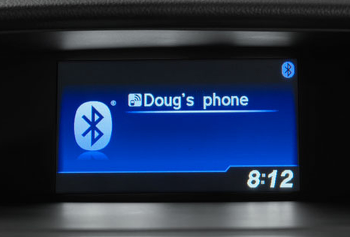 Drivers can also add a top-of-the-line navigation system or a rear-seat entertainment package. Neither the 2013 or 2014 Honda CR-V is the flashiest vehicle on the road, but Middletown drivers who select this model tend to value practicality. Most of its stylistic features have a broader purpose, like the large doors that make loading and unloading easier, especially when you are dealing with kids. Another reason that the CR-V gets such great gas mileage for a vehicle of its size is that its design stresses aerodynamics rather than a bold and bulky stance. 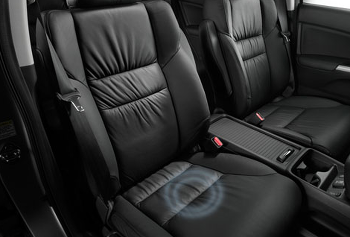 The interior of the 2013 and 2014 CR-V continues this commitment to functionality. It’s filled with storage compartments, cup holders, and cubby holes that make it easy to travel with all of your gear. The rear seats easily fold flat to create more cargo room, and a smart front console lets you keep your essentials within reach. Cargo space starts off at 37.2 cubic feet, but expands to 70.9 cubic feet with the rear seats folded down. Standard safety features include anti-lock disc brakes, stability and traction control, active front head restraints, front side airbags, side curtain airbags, and a rearview camera. That last feature is one that you rarely find on base-level trims, but it comes with every 2013 and 2014 CR-V. In NHTSA crash testing, the CR-V received five out of five starts for overall protection as well as for front and side crash protection. In IIHS tests, the CR-V earned scores of “Good” in small-overlap frontal-offset, side-impact, and roof-strength tests. So the 2013 Honda CR-V and the 2014 Honda CR-V are identical, and they are both great cars. That makes it difficult to choose one model over another. But keep in mind that newer vehicles often come with incentives and special offers. To get the most out of your vehicle purchase, work with Middletown Honda — our Mechanicstown-are dealership has a huge inventory of new and used vehicles, along with an unwavering commitment to customer service. We have lots of CR-V models on our lot, so visit our dealership and take a test drive.